San Jose, 11 February 2019 (IICA). 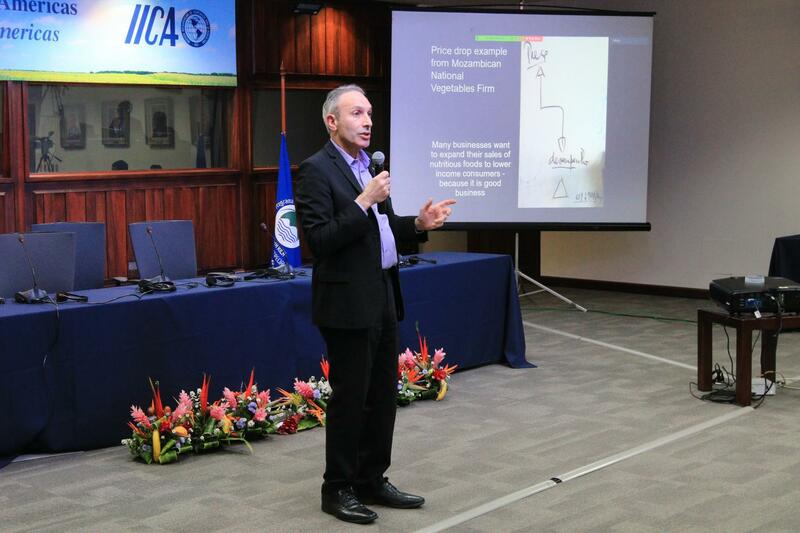 Lawrence Haddad, British scientist and winner of the 2018 World Food Prize, visited the Headquarters of the Inter-American Institute for Cooperation on Agriculture (IICA), in Costa Rica, where he analyzed the trade, policy and cultural challenges involved in feeding the world sustainably. The award-winning scientist spoke to the trends and emerging challenges in sustainable nutrition, in an address to 150 specialists from the public and private sectors, in which he explored, in-depth, issues such as nutrition, the food trade, health risks, legal measures and multinational initiatives to strengthen agriculture. “We are faced with a massive environmental problem, because what we eat affects what we produce and this has an overall impact on the environment”, said Haddad, emphasizing the carbon footprint, nitrogen, water, greenhouse gases and cropland. Haddad was participating in the II Global Conference of the Sustainable Food Systems Program, where he indicated that, “currently, there are 821 million people in the world who are suffering from hunger, while 1.9 billion are overweight and obese”, a contrast that reflects the disparities in consumption and access to food. He continued by pointing out that, “Consumption of inadequate amounts of food is a common denominator in all forms of poor nutrition, and leads to anemia, overweight, high blood pressure, type 2 diabetes and food waste”. According to the expert, one of the major trade-related factors that hampers sustainable nutrition is people’s ability to access nutritious food. He stated that, “It is extremely difficult to ensure that healthy food reaches those who need it, at the appropriate time, and under conditions that are in keeping with sanitary and phytosanitary standards, which is a situation that leads to poor nutrition in one of every three persons in the world”. Added to this problem, explained the specialist, is the fact that, “The more nutritious foods that we would wish to produce and that are commercially and nutritionally high-quality, are too expensive, which is a predicament that endangers food security”. His presentation highlighted the socioeconomic problem inherent in recommending a balanced diet to populations with lower income levels, in which the daily intake of five fruits and five vegetables would be ideal from a standard perspective, but would require 52% of the total income of the average household. Lawrence Haddad remarked that resolving this dilemma calls for the expertise of the private sector, given that this sector has a wealth of experience in creating and satisfying the demand for food. Hadded argued that, “Business is an important part of the problem, but business can also play a major role in the solution. Offering healthy food to people with less spending power is a profitable business, but it is essential that incentives be provided to both producers and consumers to make this a more prosperous market. Healthy food must be delicious and visually appealing in order to compete with nutrient-poor foods”. The British scientist maintained that it is critical that we connect producers to markets, underscoring the importance of nutrition and its impact on health. Most of all, we must stop talking about feeding the world, because the primary challenge is “to feed the world and provide nutrition, while ensuring sustainability”. Haddad closed by saying that the involvement of the public sector will be critical to this process, since governments have the power to influence this transformation through policies, incentives, and taxes, among other initiatives, and that safety could also serve as a platform to encourage the transition towards a more nutritious diet. Lawrence Haddad is the Executive Director of Global Alliance for Improved Nutrition (GAIN), which was launched at the UN in 2002 to tackle the human suffering caused by malnutrition. GAIN aims to make healthier food choices more affordable, more available, and more desirable. Last year, Haddad was awarded by the World Food Prize Foundation for his extraordinary intellectual and political leadership in bringing the issues of maternal and child nutrition to the forefront of the world food security agenda, and significantly reducing delayed growth in children.